One of well known exhibition is curated by Bernard Rudofksy titled, architecture without architect with an agenda to explore a exemplars of indigenous architecture, He travelled to some of place, took photograph, and wrote paragraph about the story that was found by him during the trip. We need to put his exhibition context to the year 1960 when Jane Jacobs did critic for city in United States, attacked architect for the responsibility detaching architecture to people in process of making architecture. This exhibition had opportunity to show, architecture, which grew in the people and could change people and had close relationship to the city. The word to sum up the quality of the exhibition was ingenious. The exhibition followed with book titled architecture without architects. 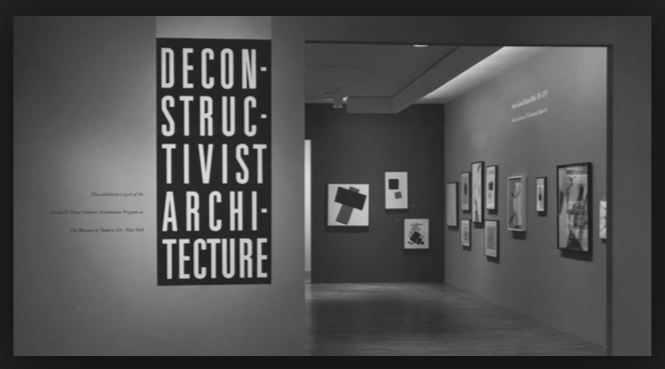 Another example is Deconstructivist Architecture exhibition curated by Philip Johnson and Mark Wigley in New York. This exhibition featured works by Frank Gehry, Daniel Libeskind, Rem Koolhaas, Peter Eisenman, Zaha Hadid, Coop Himmelb(l)au, and Bernard Tschumi. They were new generations of architecture which breaking modern architecture by its product and process. Johnson and Wigley explained the manifesto in several points to conclude the architecture phenomena; they stated that the architects recognized the imperfectability of the modern world and seek to address, in Johnson’s words, the “pleasures of unease.” Obsessed with diagonals, arcs, and warped planes, they intentionally violate the cubes and right angles of modernism. Their projects continue the experimentation with structure initiated by the Russian Constructivists, but the goal of perfection of the 1920s is subverted. Disharmony, fracturing, and mystery displace the traditional virtues of harmony, unity, and clarity. The exhibition includes drawings, models, and site plans for recent projects by Coop Himmelblau, Peter Eisenman, Frank Gehry, Zaha M. Hadld, Rem Koolhaas, Daniel Libeskind, and Bernard Tschumi (11st of projects attached). Their works are preceded by an introductory section of Constructivist paintings and sculptures drawn from the Museum’s collection. The two exhibitions: Architecture without Architects and Deconstructivist Architecture have strong agendas, informations, that could be beneficial to the public and changed the constellation of architecture in the world. I think ARA’s Exhibition: Intimacy, in the appraisal of good exhibition’s framework has 4 agendas: first, intimacy tried to minimize the gab of architect and the public, showing with it’s title and the models which can be played by public and workshop by kids, second, it exhibited the layer of the architect’s studio showing by the relics, the things around designers such as, miniatures, or even guitar played by the staffs or else. Third, it tried to exhibit the layers of communications between stakeholders such as principals and other party by notes showing communications inside whataspp group printed and hung on the wall. Fourth, it shows an introduction for ARA’s work through models, text and some diagrams. These 4 layers are combined with an attitude to open their studio for public especially for architects, young designers, students for sharing ideas, discussions, or just for chatting. The quality of the exhibition as starting is promising. It’s promising because some of the good exhibitions started with 2 main cores: agendas, and attitude, which shows that this exhibition has quality to be judged. For me this exhibition is not an ending, or omega, it is just an introduction or starter or alpha for the next sequel exhibitions which can be continued with more discussions, discourse, and sharing to architecture community in Indonesia and we can hope for architecture appreciation could be better from time to time in Indonesia.